Universal Wireless Display Receiver Turn your HDTV into a smart TV with EZCast Wireless Display Receiver. Dual band 2.4GHz/5GHz wireless antenna offers you the best wireless display experience with a fraction of the cost. ★Wireless Display: Support to mirror and stream your mobile devices to TV/Projector or any HDMI display wirelessly. Turn your HDTV into a smart TV, use your mobile devices as the controller. ★Powerful Configuration: Univeral Wireless Display Receiver runs Dual Core, Dual Decoder, and Dual Band 2.4GHz/5GHz Concurrent AP- router and P2P connection. Better Media Experience in mirroring and Streaming. 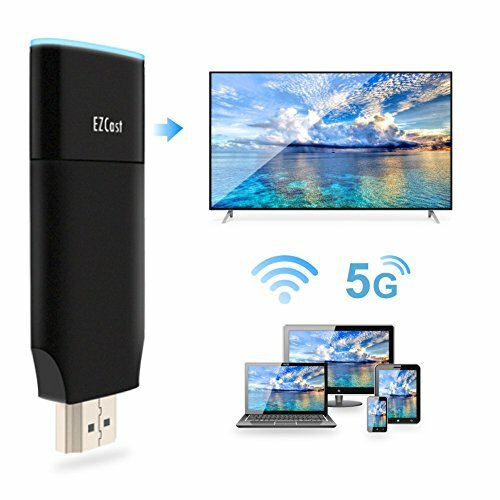 ★Multi-Compatibility: Compatible with multiple Wireless Display Technologies, including Airplay, MiraCast, DLNA, and EZCast APP. Use EZCast App to Expand Screen Mirroring Capabilities. Unleash the screen mirroring potential of your iOS, Android, Windows and Mac Devices. ★Good compatibility: Works with Smartphones and tablets (Samsung, Sony, iPhone, etc) with Android 4.4+ and iOS 8.0+. Compatible with Windows 8.1 and later with built-in Miracast capabilities. Note: Not compatible with Windows 7/XP and Windows 10 systems. ★Support OTA updates: Through the cloud server, we will regularly update the firmware to improve compatibility, add new features and fix bugs. It keeps working with the newest version of your device. Also, all EZCast products are backed by manufacturer 30-day money back guarantee with a 1-year warranty and our support team will reply within 24 hours for any technical support. If you have any questions about this product by EZCast, contact us by completing and submitting the form below. If you are looking for a specif part number, please include it with your message.